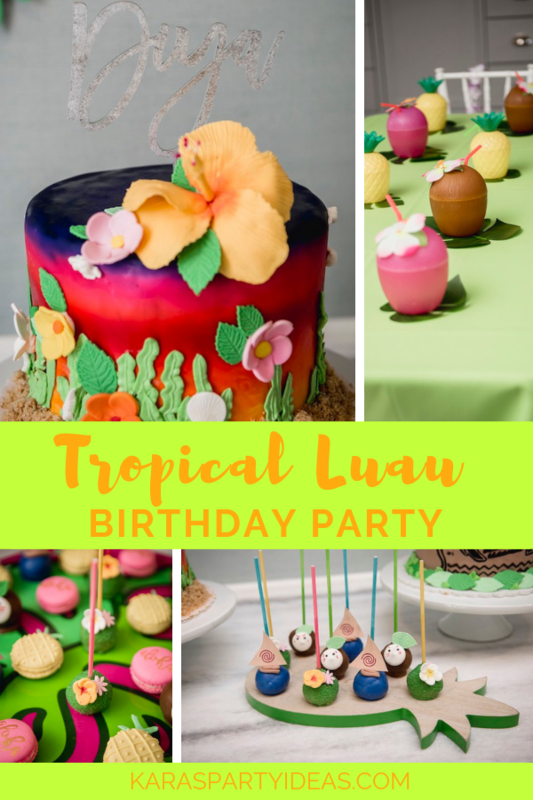 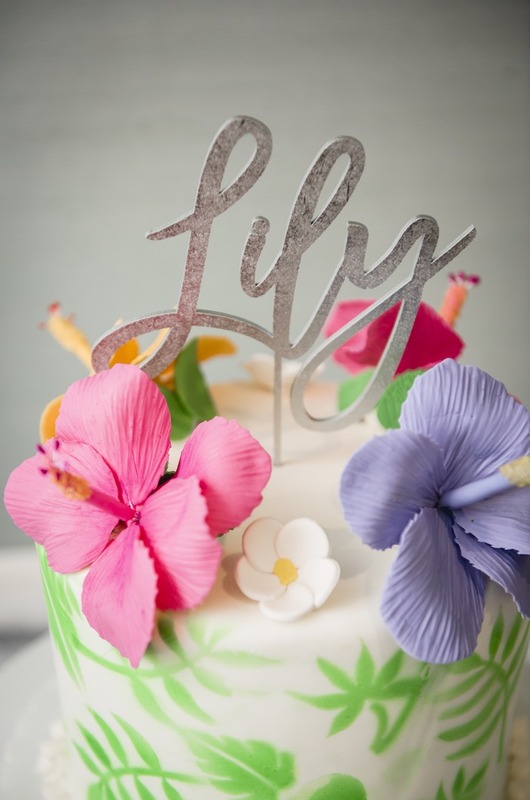 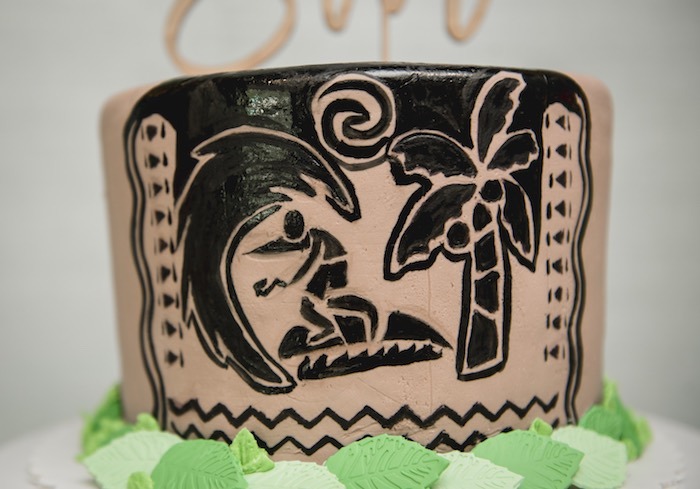 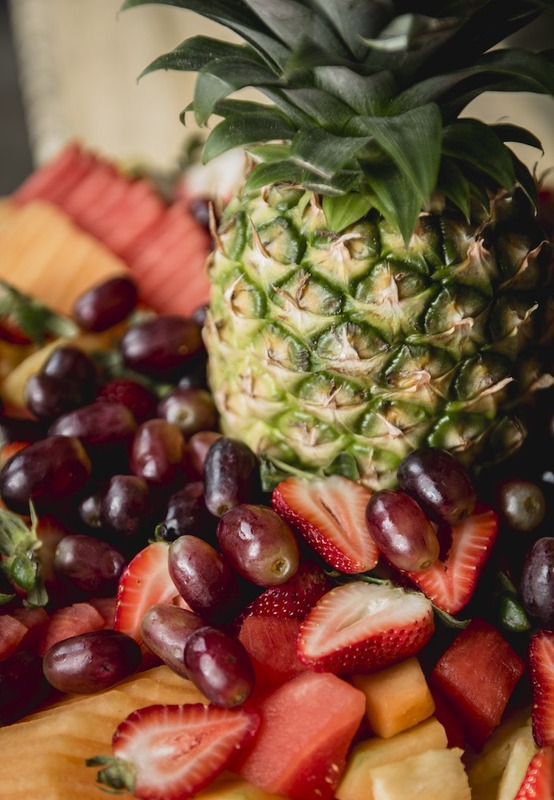 Sip your drinks and feel the sun, this Tropical Luau Birthday Party brings all sorts of fun! 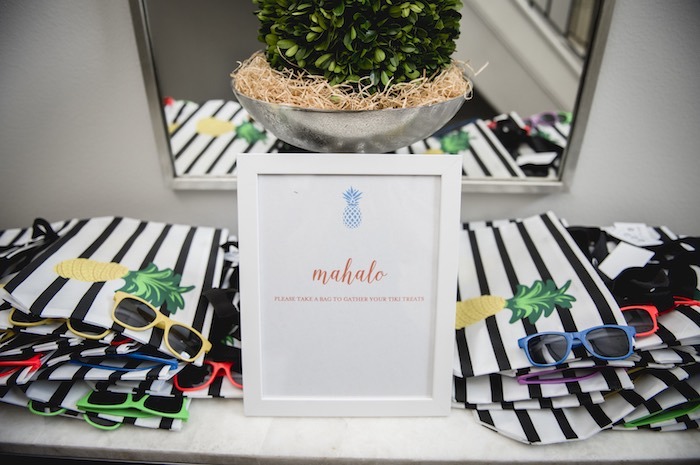 Styled by Kelly Doonan of Sparkle & Shine Events out of Houston TX; this fabulous bash is packed with darling details you’re sure to love! 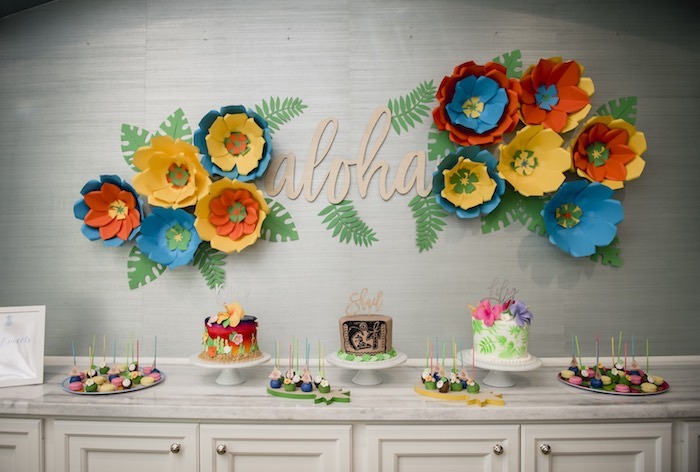 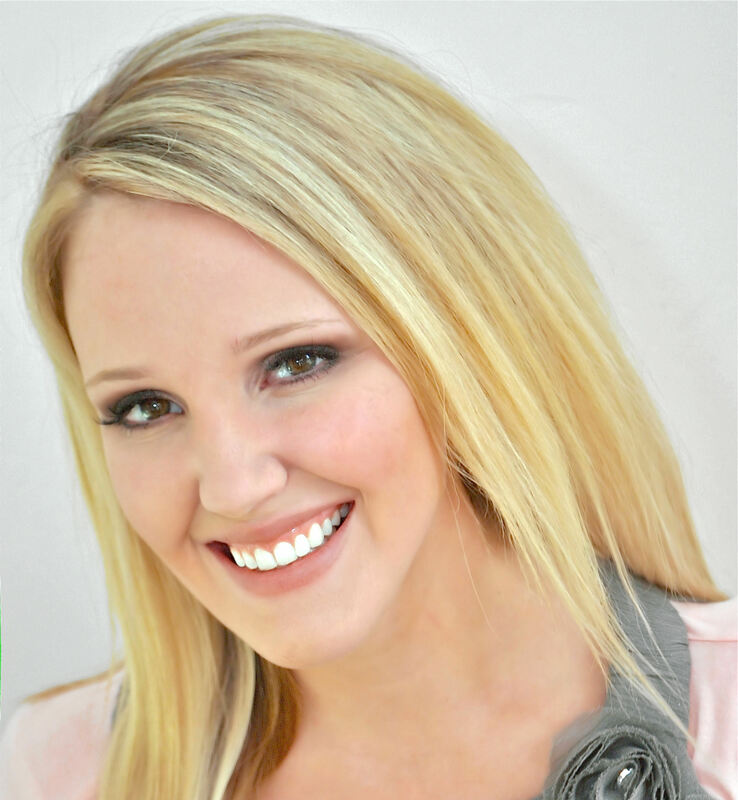 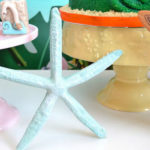 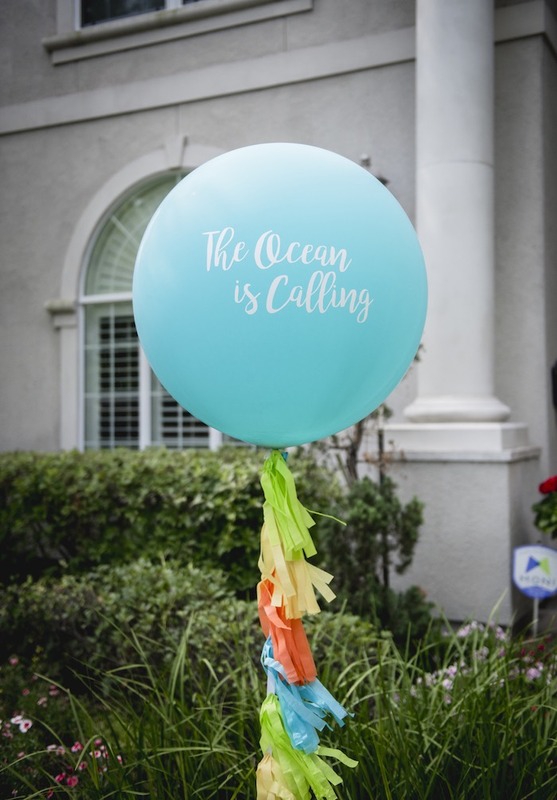 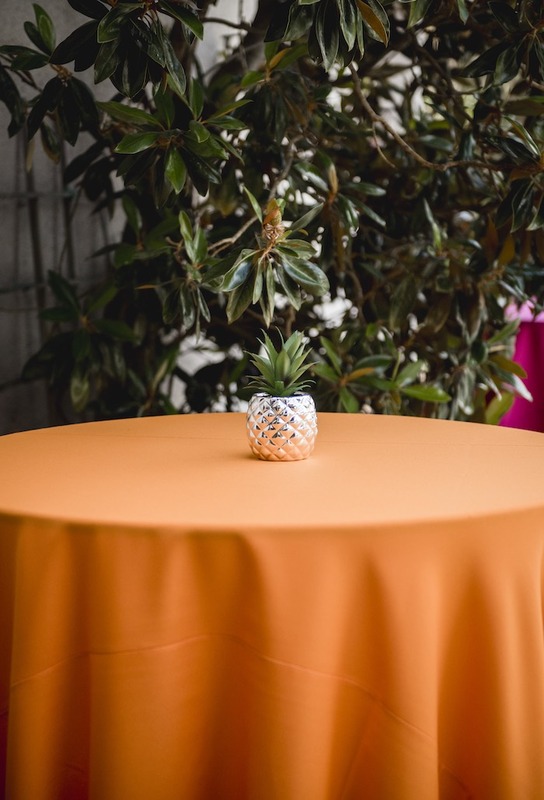 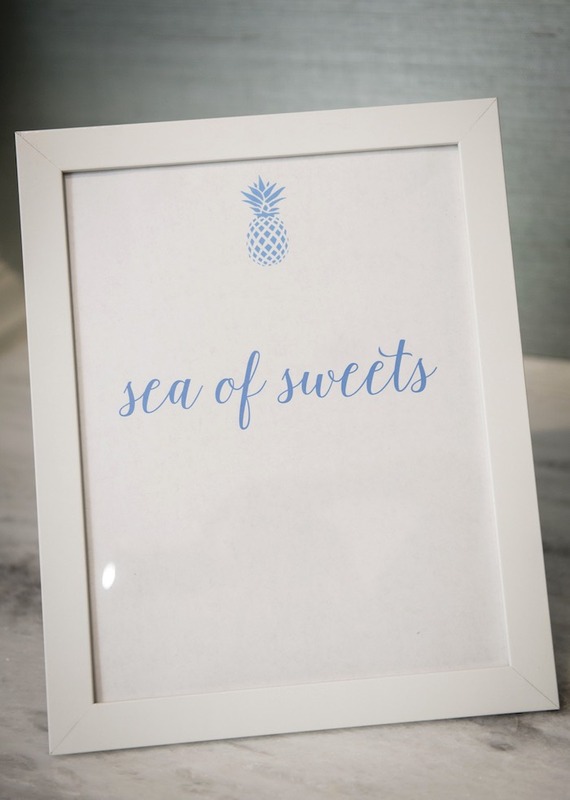 “The party was for three siblings, ages 2 (boy), 5 (girl), and 7 (girl) so the party had attendees of various ages and interests so I chose to be mindful of this when choosing the decor and activities. 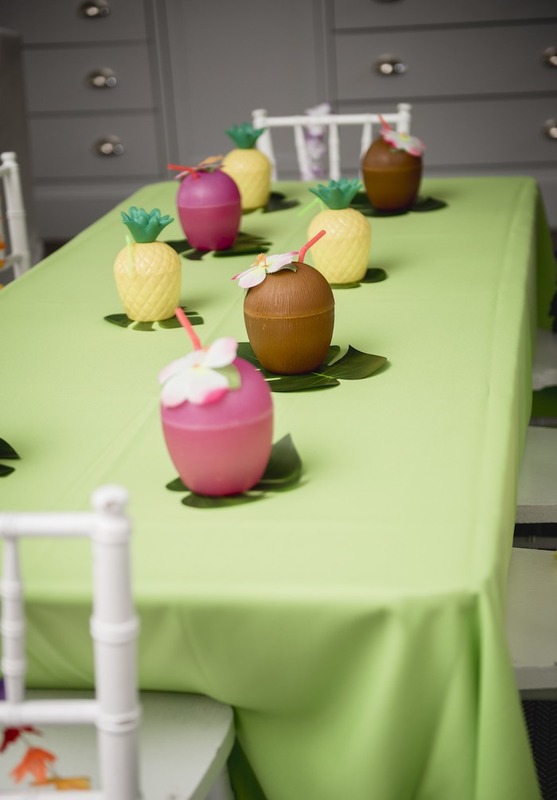 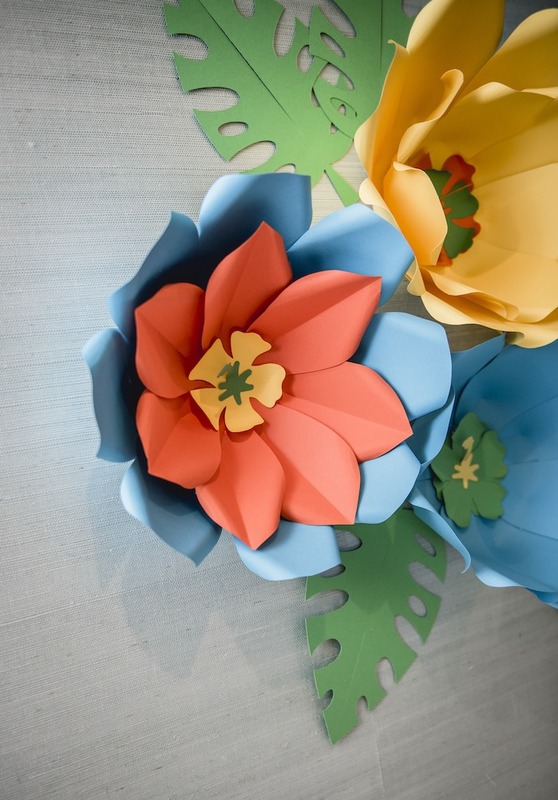 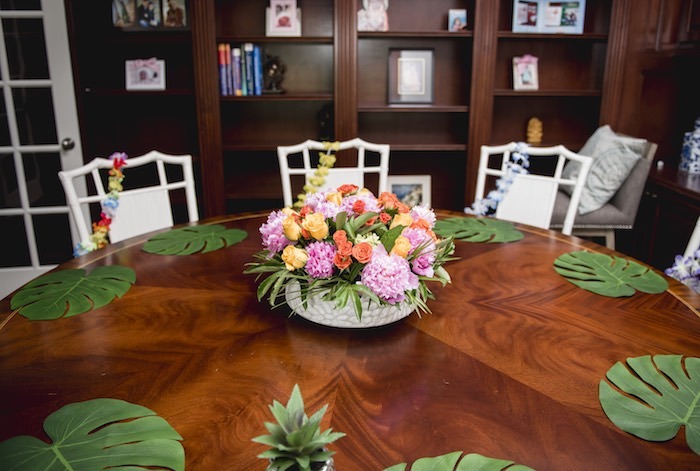 The inspiration was colorful and tropical, but gender neutral. 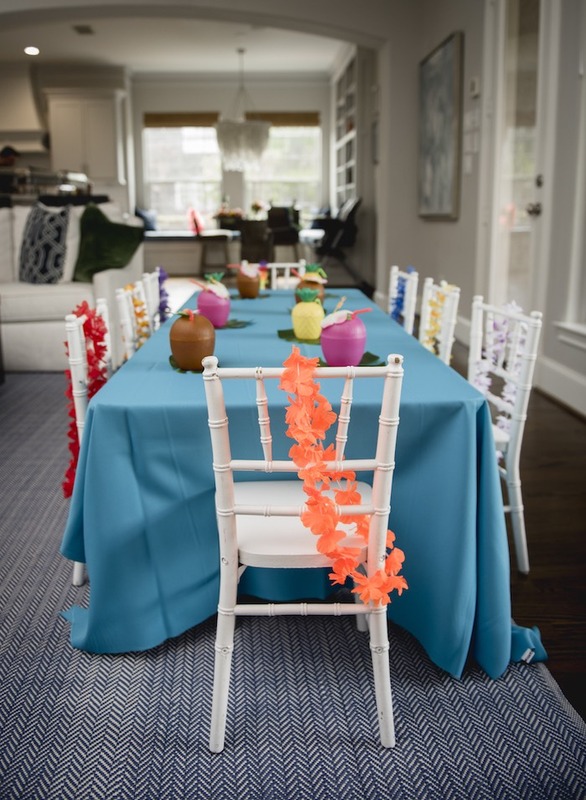 For the linens, we chose festive, bright colors. 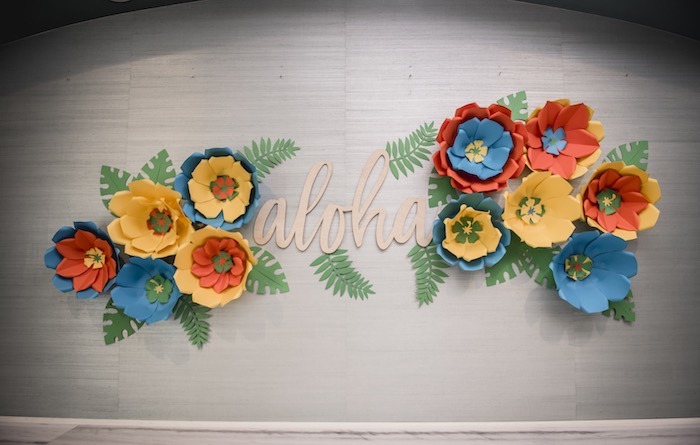 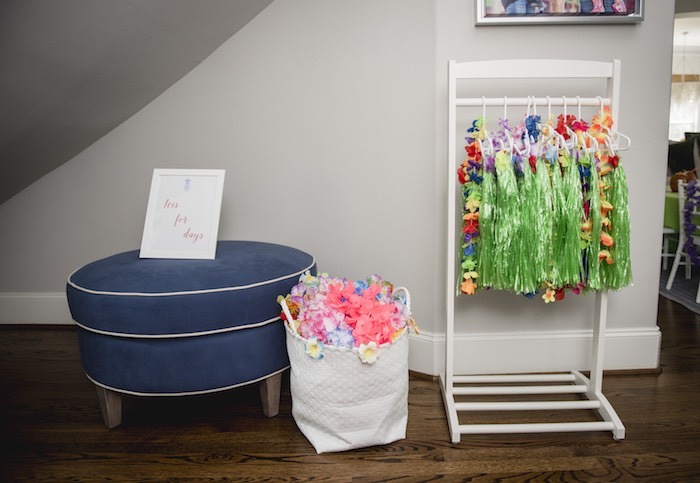 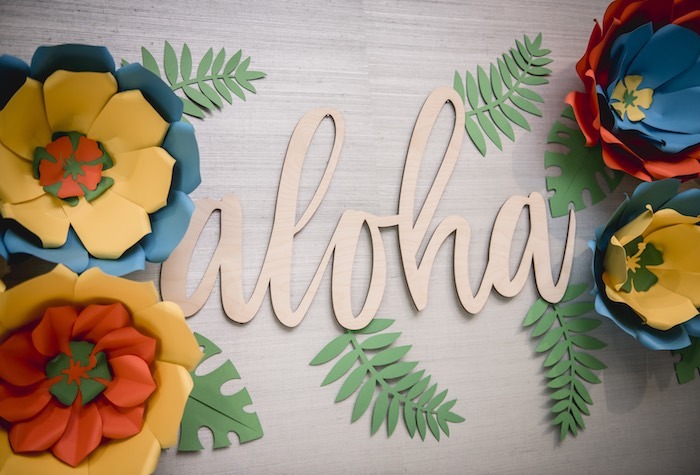 We also provided dress up gear (grass skirts, sunglasses and leis) for the attendees to wear and snap photos in front of the aloha display (then turned dessert display). 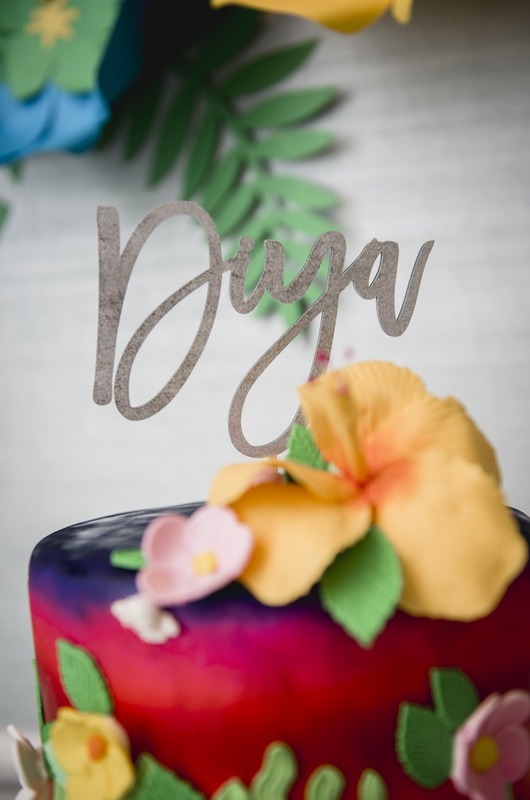 We had the Disney princess Moana come and teach the attendees how to hula dance. 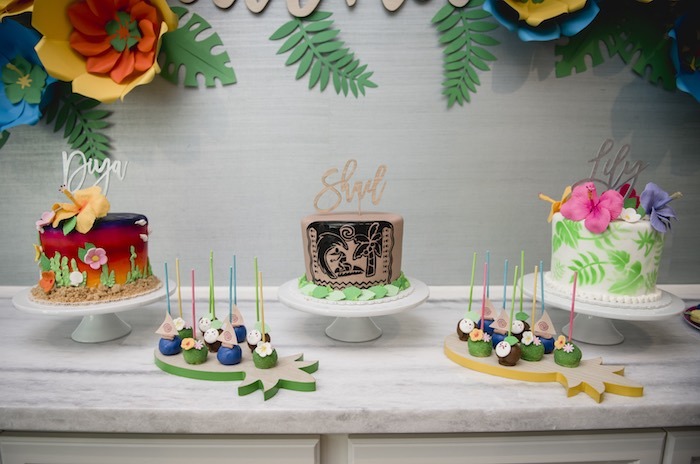 Moana was an absolute hit with everyone, even the adults. 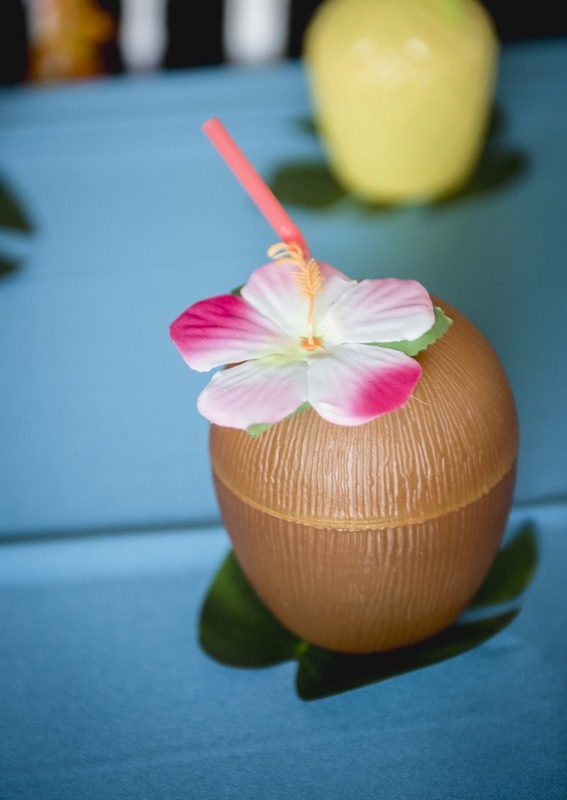 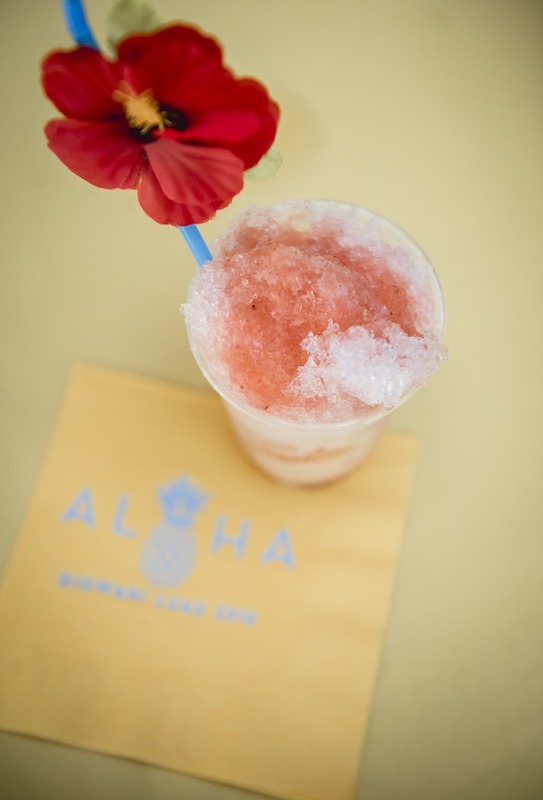 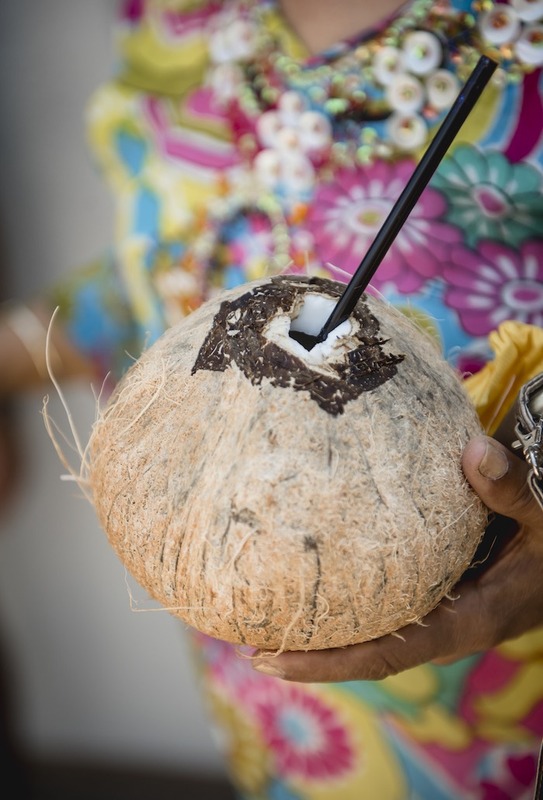 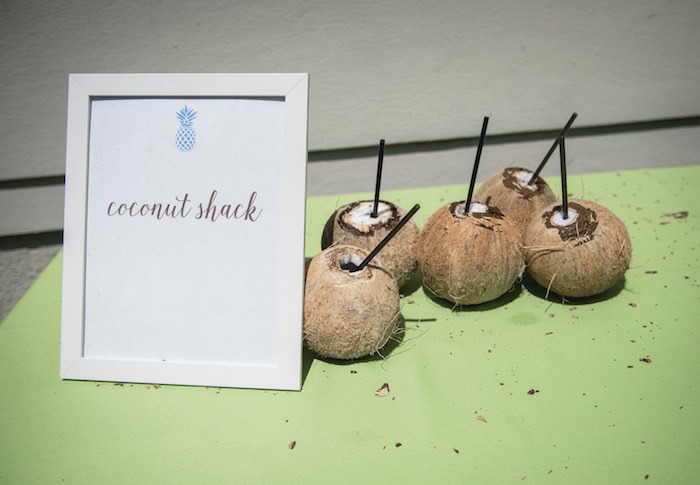 For beverages, since it was in mid-May in Texas and mostly outdoors, we chose to provide light and refreshing options such as organic snow cones and coconut water served in real coconuts. 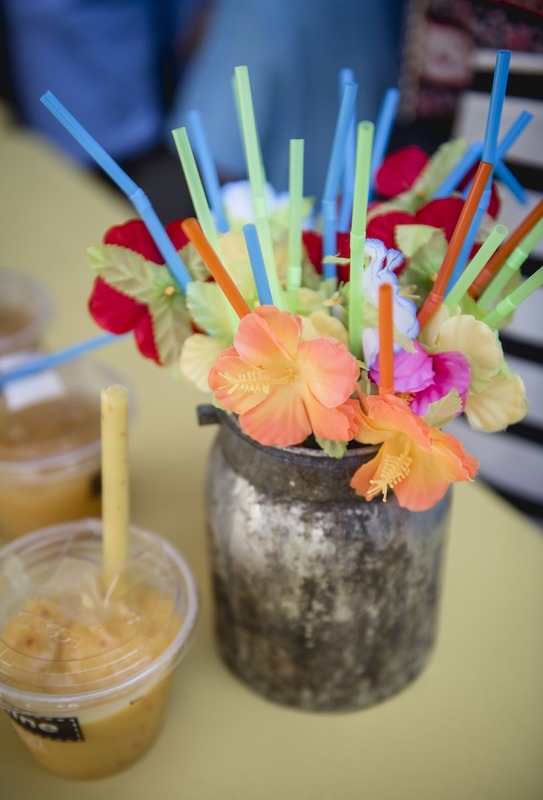 We also had an organic juice and smoothie bar for guests to partake in. 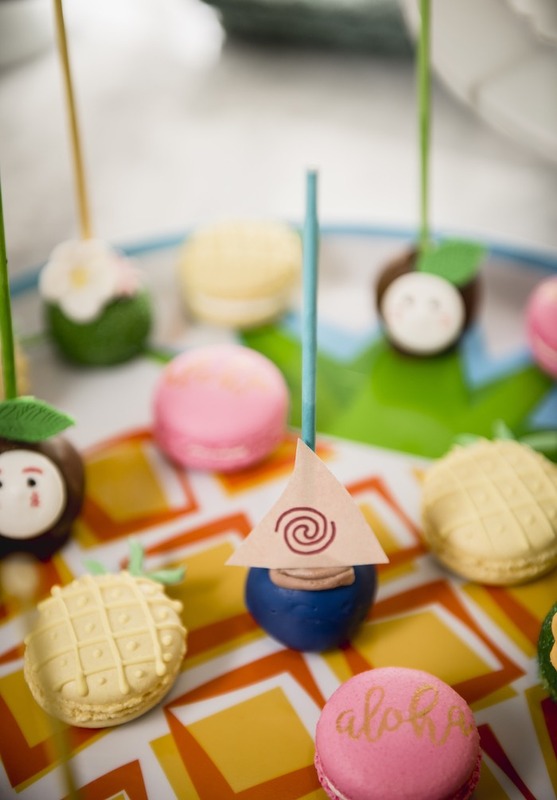 For the desserts, we wanted to provide an assortment of options and play ode to the Moana movie as well. 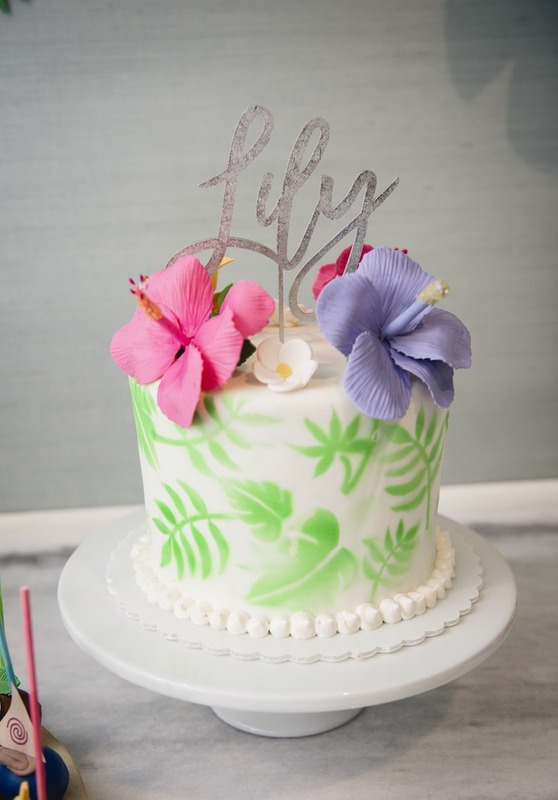 For the cakes and macarons, we chose to make them tropical. 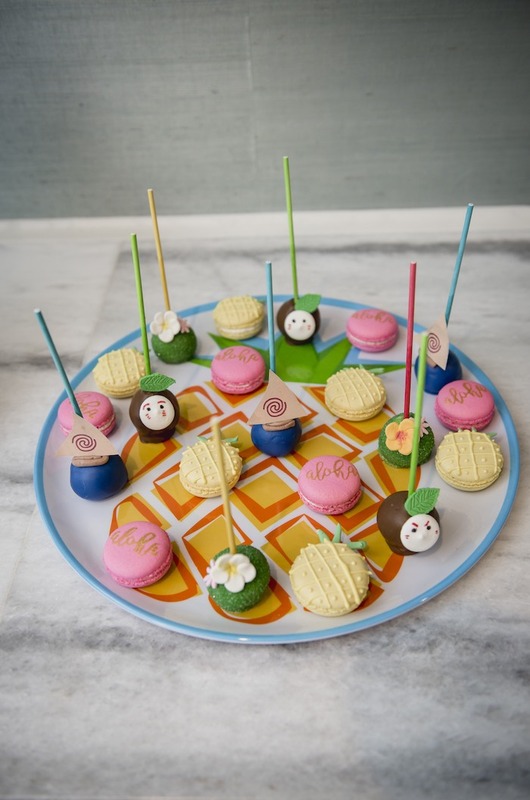 The cakes were different based on the personality of the child. 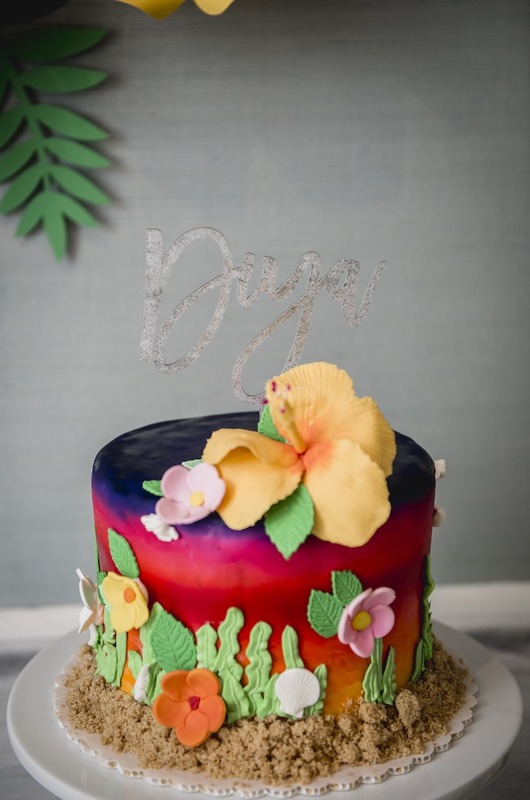 One had tropical leaves and flowers, the other had a rainbow beach scene and the other displayed a tribal tattoo design. 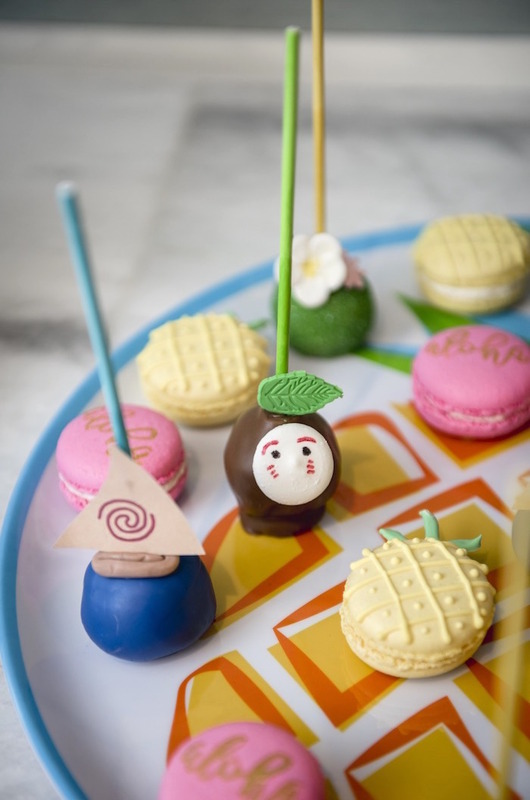 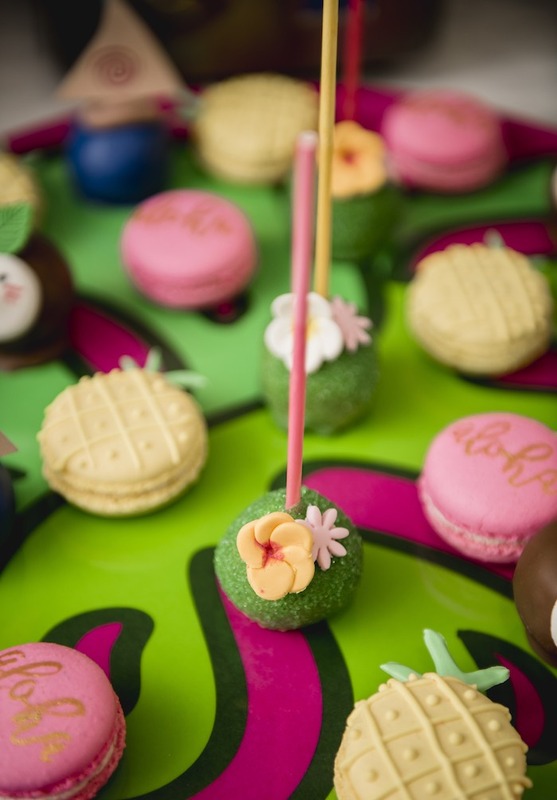 The macarons were pink with aloha written on them and also in the shape of pineapples. 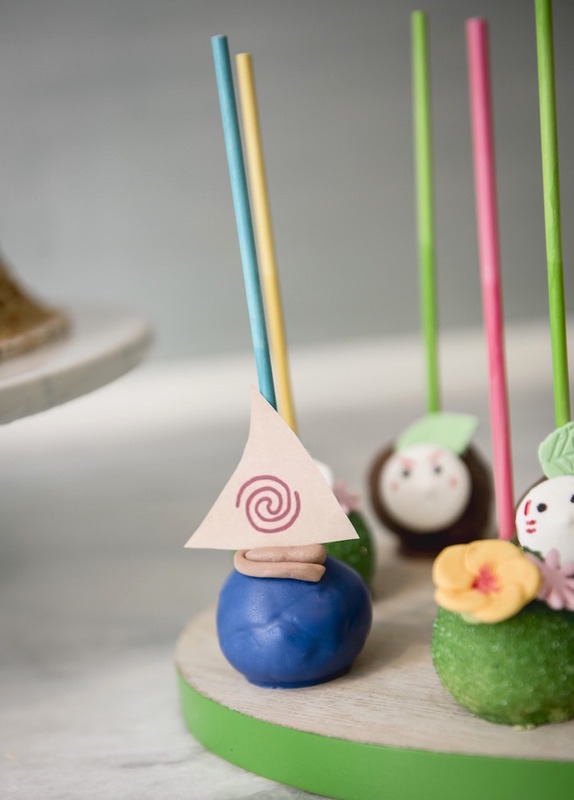 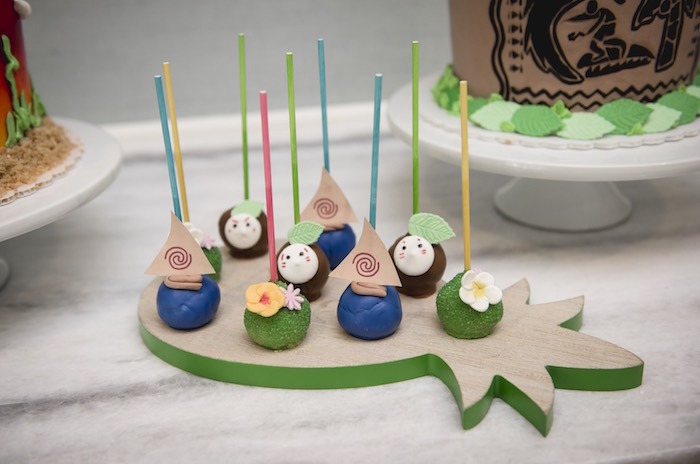 For the cake balls, we decided to have symbols from the movie (the boats, kakamoras and hibiscus flowers). 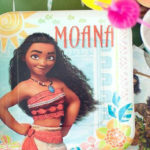 As for activities, we had sand art, face painting and balloons and hula dancing with Moana.